I have a refurbished Dell laptop with Windows 7 64bit installed. I haven't been able to install Microsoft updates. I have seen the history of updates and there isn't a pattern as to why some installed but most of them didn't. I have run the Microsoft Update Troubleshooter, tried to install them in safe mode, and download the System Update Readiness Tool but it wouldn't install because it is an update itself. There is 2 sets of Windows.old files (and windows.old000) on the hard drive if that is of any help. Service Pack (KB976932)is installed. I am sorry you have been left without a reply. Occasionally a post is overlooked simply because of the vast number of posts requiring attention. 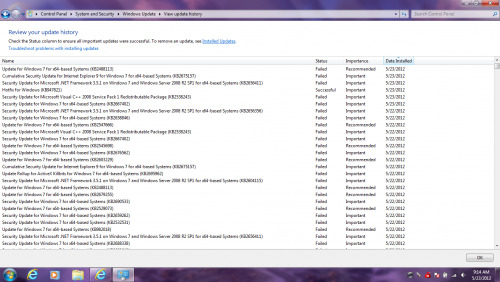 The system update readiness tool, is not usually effected by the problems associated with updates in general. For instance many updates to Net Framework fail because the exisitng net framework installations are in some way corrupted. Other updates fail when a Firewall, other than the Windows firewall will not allow the update and the same situation occurs with some anti-virus programs. Please do that from here. The FIXIT which is far easier than the manual method will usually be offered in default mode and agggressive mode, run it in deafult mode first please. REBOOT and try again please. If still no good, send me the error recorded on the installation failure please from event viewer. If you are unsure of how to - please post and I will advise, but basically Control panel, Admin Tools, event viewer, expand windows logs left pane, application and on main window, click the heading level, that will sort them in order. Also in left pane click windows logs, system and in find on right pane, type the word update. Also go Control Panel Windows updates, view update history, on left pane and obtain details from there. of failed installations. The computer always says updates are ready to install, but never follows through with the task. The shut down icon has the update message showing but never installs updates after shutdown or restart. The time shows tomorrow but I manually do this update myself now and it alway fails. Also, error code 800736B3 appeared after running the System Update Readiness Tool. Edited by Ben T, 23 May 2012 - 11:25 AM. Update settings as instructed. Time and date were correct. Run update to test. Failed again. 3. What please was the result of the fixit for reset update components, did it run. Disabled automatic updates. No change. Update Readiness Tool, no change after reboot. I use Windows Firewall and Microsoft Security Essentials. [quote.] What please was the result of the fixit for reset update components, did it run. It ran but didn't change the ability to install updates. I didn't try changing the registry settings or the aggressive method. After running FixIt, it stated that the problem was fixed. But after running windows update, the problem still remains. As per the aggressive mode, do you want me to use command prompts to change the registry settings?